When it comes to electric shavers, men have different priorities. Some men want versatility and convenience while others opt for the safer ones. Choosing the best of the best can be difficult since there are a plethora of products that are available in the market. In order to make your job easier, we’ve scoured for the 10 Best Electric Shavers. Choose the best electric shaver that is perfect for your type of skin and hair. Should you go for an electric shaver that is excellent in close shaving or the one that gives you comfortable shaving. In reality, your choice of the best electric shaver will greatly depend on your personal preference. This is because a product that is suitable for one person may not be appropriate for the needs of another person. Actually, there are different factors that you need to consider before making a purchase. These factors include design, features, comfort, and style. This is why it’s going to be a tough decision. In our list of the best electric shavers, we’re going to examine its comfort level and other important features. Some electric shavers can be used while it is still plugged in. For instance, the Braun Series 7 electric shavers permit corded shaving but it can’t be done on the Braun series 9. The LED indicator will keep you aware of the current level of your battery. Be sure to choose an electric shaver that is easy to use and clean. Some models come with a cleaning dock. All you have to do is place the shaver inside and press a button. The wet and dry technology allows you to shave on dry skin or under the shower or with the use of a shaving cream. A pop-up trimmer is also very handy. It’s very helpful in cutting out sideburns and mustache. Braun Series 7 790cc is undoubtedly one of the most popular electric shavers. This shaver from German Tech Industry is also the most sold electric shaver, making it one of the best electric shavers of all time. That is why it is no surprise why we placed this in the top spot of our list. The best feature of Series 7 790cc is its ability to give you close and smooth shave. It has 3 trimmers wherein the two are OptiFoil and the third is ActiveLift. The OptiFoil trimmers can cut more facial hairs with just a few strokes while the ActiveLift will cut the short and ingrown facial hairs. Since this is a Pulsonic electric shaver then you can guarantee that it can capture numerous hairs in every stroke. It has a flexible head so you can easily move it around your face. The Cleaning and Charging Dock can kill almost 99% of the germs with just a single press of the button. What’s more, it comes with 3 personalization modes which consist of Normal, Intensive, and Extra Sensitive options. Choose the best mode that’s appropriate for your hair and skin type. Additionally, it has a pop-up trimmer that can be used for trimming mustache, beards, and sideburns. With Cleaning and Charging Dock. Comes with 3 personalization modes. It does not have a wet and dry technology. The Braun series 7 790cc is definitely the best electric shaver 2019. With its personalization modes, three trimmers, flexible head, durable construction, charging and cleaning dock, you can surely enjoy a comfortable and close shave anytime. It is one of the most budget electric shaver and our all time favorite choice! Get this shaver here! 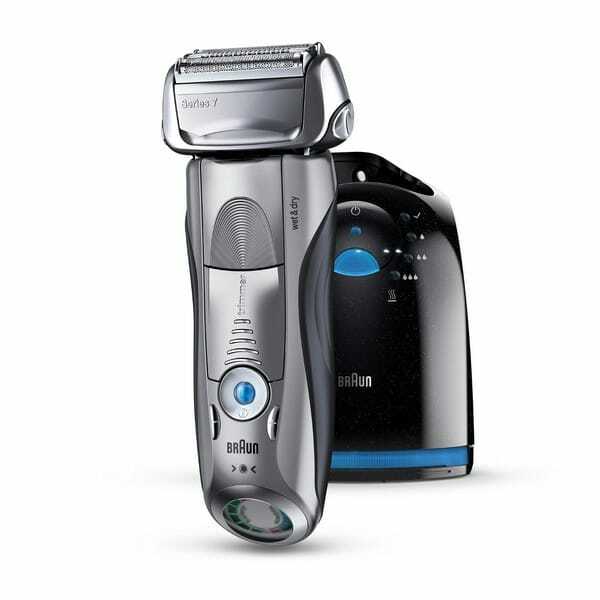 Braun Series 9-9095cc is our second favorite model and is the latest electric shaver being launched by Braun. It looks cool since it is made of shiny chrome. This electric shaver is more or less the same with the 790cc model except for its extra trimmer. This extra trimmer is called Direct & Cut since it assists the shaver in fixing and cutting the hairs which grow in various directions. The ActiveLift trimmer in the 790cc model is being upgraded to the more advanced HyperLift Trimmer in order to cut out those flat hairs. Series 9-9095cc does an excellent job for a close shave and it also comes with a pop-up trimmer. So, you might be wondering why it’s our second best choice? Well, it’s because this electric shaver is all made up of plastic. If you are willing to pay more in order to get a comfortable shave then this is the best electric shaver for you. It contains all the features found in a 790cc model with the inclusion of the wet and dry technology. This technology allows you to use your shaver on dry skin or when using a shaving gel. Check prices here! Includes wet and dry technology. Comes with an additional trimmer known as Direct & Cut. The Braun Series 9-9095cc consists of excellent features including the wet and dry technology which is not found in the 790cc model. Additionally, it comes with an extra trimmer which is best for cutting down hairs from various direction. The downside is it is quite expensive and is poorly constructed since it is made of plastic. If you are looking for the best electric razor for close shaving then Panasonic ES-LV81-K is the perfect product for you. Since it is a product from a Japanese company then you can guarantee that it is made of high quality. This foil shaver is made up of 5 blades to give you a remarkably close shave. This is the top electric shaver for men who have heavy and dense beards. It comes with a cleaning and charging dock as well as a LED panel to let you know the status of the battery. It also includes a side trimmer to assist you in cutting out your beard and mustache. Panasonic ES-LV81-K Arc5 is made up of five foils with three types. The three slit foils are great for trimming long and heavy hairs. The one lift-tech trimmer is for cutting out ingrown and flat hairs. And lastly, the one finishing foil is best for trimming hairs which grow in various directions. Everything about this product is superior! So, there must be a reason why it is in the third place. This electric shaver is not so comfortable and its head feels a bit bigger and bulkier. Among all the electric shavers, this one is not suitable for men who have very sensitive skin. The best electric shaver for dense and heavy beards. With wet and dry technology. Includes 5 trimmers and an adjustable head. Provides you an excellent close shaving. Not suitable for people who have sensitive skins. It is not very comfortable to use. Indeed, Panasonic ES-LV81-K Arc5 is the best electric shaver from Panasonic since it performs well. However, it is not too comfortable to use if you have a sensitive skin. But you are welcome to try it. If it suits you then go for it. Check for availability here! This is the best rotary shaver that can be used on beards and heads. Philips is the most trusted brand for rotary shavers. Philips Norelco SensoTouch is the best electric shaver for a close shave. It has 3 separate foil which moves smoothly on your face or head. Its flexible head is capable of reaching all the hairs in different areas. The foils can easily move, tilt and spin in any direction. That is why it is considered as the best electric shaver for shaving the head. The shaver’s head, also known as GyroFlex 3D, can move in three different dimensions. One of its top features is the Super Lift&Cut, which is capable of capturing stubbles, in-grown hairs, flat hairs as well as hairs on the neck and jawline. The shaver’s head can move in 3 various dimensions. It has a fixed battery which means that you need to buy a new shaver in case the battery gets damaged. Charging can only be done using the dock. Its replacement parts are very costly. This shaver feels cheap since it is only made of plastic and rubber. 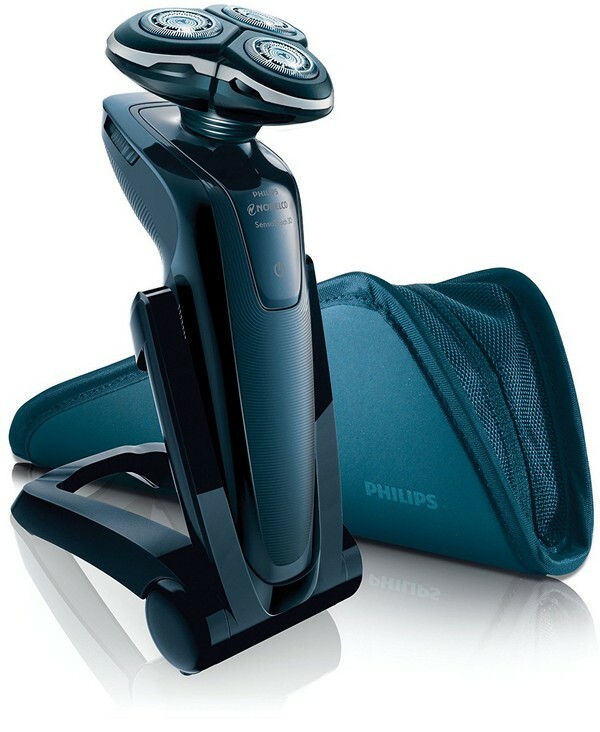 Philips Norelco SensoTouch is one of the greatest rotary shavers. It uses advanced technology and the most recent features. This is the best electric shaver that can give a comfortable and close shave. However, due to its downsides, we placed it in the fourth place. Buy it here! This is the best budget electric shaver for close shaving. Panasonic ES-LA63-S Arc4 is quite similar with Arc5. The only difference is this model has only 4 blades and it does not include a Cleaning and Charging dock. It provides you with an excellent close shave but not too comfortable to use. Arc4 uses the sharpest and the most advanced 4 blade system. A cheap electric shaver that gives you amazing features. The LED panel shows the motor speed as well as the status of the battery. It has no Cleaning and Charging dock which is why it is inexpensive. Basically, it has the same features with Arc5 minus the single trimmer. This is a powerful electric shaver that can pivot in different directions. Get this shaver here! This is one of the most popular electric shavers in the market today. If you do not want to spend more then Philips Norelco AT830/46 is a perfect choice. This is a PowerTouch electric shaver that includes several features including the wet and dry technology, DualPrecision Technology and a pivoting head. The shaver’s head is flexible but not in 3 dimensions like the Philips Norelco SensoTouch. DualPrecision Technology is effective in cutting out stubbles for comfortable close shaving. This shaver includes pop-up trimmer and has a long battery life. A single charge takes only one hour. Rotary shavers are designed to give you smoother and more comfortable shaving experience. Very comfortable to use, making it ideal for people who have sensitive skins. Shaver’s head is not capable of pivoting 3 dimensions. 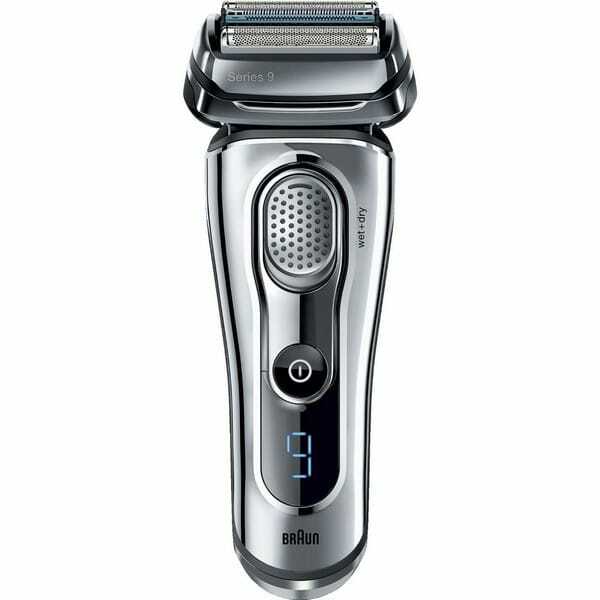 Philips Norelco AT830/46 is an affordable electric shaver that provides you with excellent benefits such as long battery life, wet and dry technology, DualPrecision Technology and an adjustable head. It is very easy to use and clean. This shaver gives you a comfortable close shaving experience and operates quietly. Purchase it here! Wahl Professional 8061 is a popular choice among professional barbers. This is an American product which is powerful, durable and very affordable too. It utilizes Dynaflex Cutting system which is effective in trimming hairs located in hard to reach areas such as the neck and jawline. Since it is very flexible then you don’t have to worry about any burns and cuts. It provides hypoallergenic foils which are best for close shaving. With its antimicrobial protection, you can be assured that you are always safe from any bacteria. This is the main reason why it’s the best electric shaver for people who have sensitive skin. Wahl 8061 is designed in such a way that it is very easy to use. Even though it is entirely made of plastic yet it feels like a superior brand. What makes it excellent among all other electric shavers is that it is hypoallergenic. Aside from this, it also comes with a pop-up trimmer for cutting out mustache, beards, and sideburns. Uses hypoallergenic foil heads, perfect for people who have sensitive skins. Ideal for travel use since it has a long battery life. Not very comfortable to use. Does not include wet and dry technology. Can only be used for stubble length hairs. It has extensive vibrations, making it uncomfortable to use. Wahl Professional 8061 is one of the best electric shavers for those who have sensitive skin since it is hypoallergenic. You can bring it with you as you travel since it has a long battery life. It’s very easy to use and clean. With all of these features, you are actually getting what you paid for! Get your shaver here! This is another excellent electric shaver from Panasonic. Regardless if it is inexpensive yet it gives you the best close shaving experience using it’s 3 intensely sharp blades. It also features a LED indicator where you can keep track of the battery life. Uses a wet and dry technology. Unlike the other Panasonic models, Arc3 does not include a cleaning and charging dock, which is understandable since its only very cheap. This electric shaver uses 3 hypoallergenic nanotech blades which are best for people who have sensitive skins. It has a pivoting head to give you a smooth close shave. Comes with a wet and dry technology. Uses sharp and hypoallergenic blades, which is ideal for sensitive skin. Does not include a cleaning and charging dock. Has a very loud sound. Panasonic ES8103S Arc3 is a cheap electric shaver that includes a lot of handy features. It has no cleaning and charging dock, which is the reason why it has a low price. Apart from this, it comes with a wet and dry technology so you can use it with a dry skin or a shaving cream. It also has a long battery life which is great when you are traveling. Check for availability here! Remington F5-5800 is another budget electric shaver from a popular brand. Remington has a wide variety of electric shavers. In fact, they are the ones who first launched the cordless recharging system. This affordable electric shaver consists of two foils and a single trimmer. It has an adjustable head which moves swiftly around your face, giving you a smooth and comfortable shave. You can easily clean it by detaching its head. Just place it under running water and you’re done. It does not give you any irritation at all. Remington F5-5800 is a very affordable electric shaver. Gives you a smooth and comfortable shaving experience. It is not suitable for close shaving. You need to replace the blades after 3 to 4 months. Remington F5-5800 is the best choice if you have a low budget. It gives you a comfortable and smooth shave. It has several drawbacks but this is why it is very affordable. Check for prices here! Braun CoolTec is a cool electric shaver that gives you a smooth shaving experience. This is one of the best electric shavers from Braun since it uses TEC (Thermo Electric Cooling) technology. A perfect choice for those who have sensitive skin. Aside from this, it also comes with a wet and dry technology so you can use it on dry skin or in the shower. Since it is waterproof, then you can easily rinse it with water after using. One of its best features is its Cooling Technology which keeps your skin cool and prevents any irritation. Aside from this, it can also reduce the redness on your face as you shave. Its SensoBlade technology allows the shaver to catch and cut out hairs which grow in various directions. Charging takes one hour and it has a battery backup of 45 minutes. However, if you turned on the Cooling feature then the backup battery can only last for 15 minutes. The Cooling feature reduces the battery life. The CoolTec function is not suitable for gels and foams. Braun CoolTec is an amazing electric shaver with an excellent design and gives you a comfortable shave. It has a cooling feature that works great for people who have sensitive skins. Probably, one of its main drawbacks is its low battery life. Buy your shaver here! Electric shavers were first launched during the 1960s. The main benefit of these amazing electric shavers is its ability to trim hairs with just a few strokes without the need of shaving cream. Additionally, it can also do a close shaving. There are two types of electric shavers, the foil shaver, and the rotary shaver. These two differ in their cutting motion. A foil shaver trims hair in an oscillating manner while a rotary shaver spins around. The very first razor being sold in the market was the single edge razor. Then comes the double edge razor. When it comes to the cost, there’s really not a big difference between the two. A mid-range electric shaver can cost about $200 plus the cost of the blades. A razor costs about $20, however, you need to replace its blades more often. If we talk about convenience, razors cannot beat the speed of electric shavers. So, how about the actual shave. Electric razors can pivot around the contours of your face to give you a close shave. On the other hand, if you use a double edge razor then you have to use an excellent shaving cream so you can achieve a smooth close shave. Which one is more portable? If you are traveling by plane then you should not bring razors since they are prohibited. It’s best to bring electric shavers. So, which one should you choose? Electric shavers or razors? Both of them have evolved throughout the years. They also have their own distinct advantages and disadvantages. Razors are perfect for people who are patient and have more time for shaving. They are also confident that they won’t get any cuts. They have enough money for buying shaving creams. Electric shavers are best for those who need a quick shave. They don’t mind buying an expensive shaver. Sometimes these electric shavers may not provide you with a thorough shave compared to razors. Actually, it will depend on your personal preference. If you are unsure then it’s best to try both and see which one suits you the best.